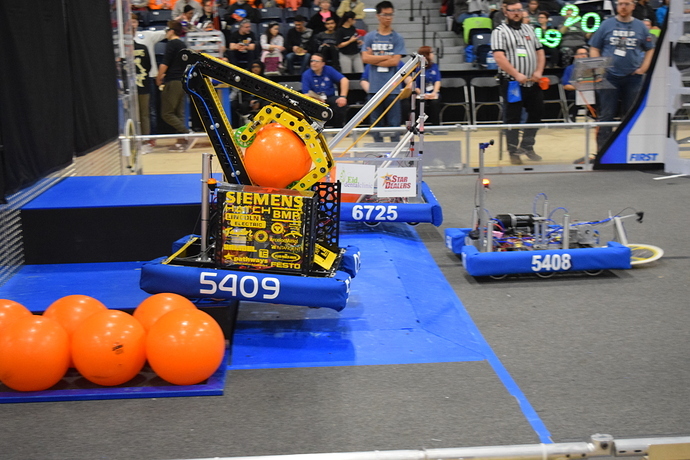 I’ve been a member of 5409 for 2 years now, and this year was by far our best. We’ve qualified for ONT DCMP for the first time in our team’s history, the farthest we’ve gone as a team in our history. (Never been to worlds or any event farther than regionals before). We won the Quality award at Durham College and the Imagery award for the Technology Division at ONT DCMP. While I love to show off our robot, I also want your thoughts and opinions on it. I would absolutely love to hear what you think about our design choices and your thoughts on our robot as a whole. That is a freaking work of art. Some deeper analysis at the start of the season and a hatch mech would have been cool to see on this thing. What’s the new hatch mech like? Our hatch mechanism is just two suction cups mounted to the front of the Claw intake (can be seen in the last picture), and it works pretty well. We didn’t get picked at DCMP so we used all our free time to program and get the mechanism working… The only reason it didn’t work is because we couldn’t prove our mechanism worked before the start of competition season. If we had thought ahead more we would’ve been a Hatch/Cargo bot. I LOVE that third photo! That is a great looking robot! Too bad you won’t be at Detroit, would’ve loved to see it in person! Congrats on a great season and good luck next year! The bot looks terrific and the photos are awesome. I watched 5409 with interest this year as the design looks good and also well built. 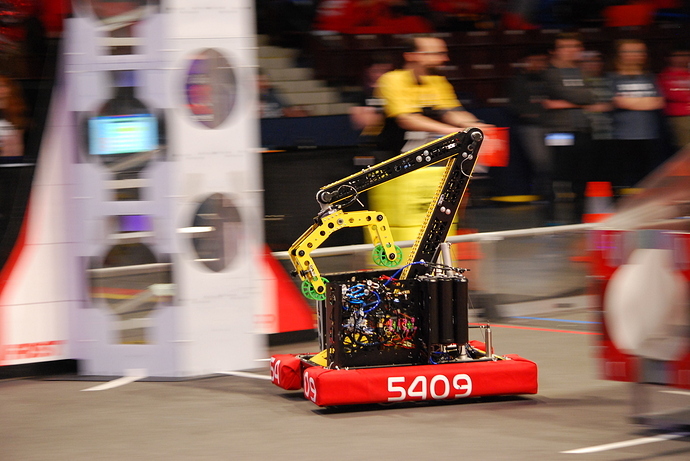 Watching your earlier matches in Windsor, I noticed that the bot didn’t have smooth motions. This can make it really hard to drive and acquire objects. This looked markedly improved by DCMP. The other suggestion I would make is that for ball intake the device should be wider than it is, maybe a single roller about 8-12 inches wide with another bar below, 2056 is a good example of a really simple single roller intake that just works. Even 3-4 seconds hunting trying to ingest a ball is too much, it means losing a full cycle over elite level bots for every 3 or less that you perform. I’d have to review anything else about hatch mechanisms as I don’t recall how yours worked. 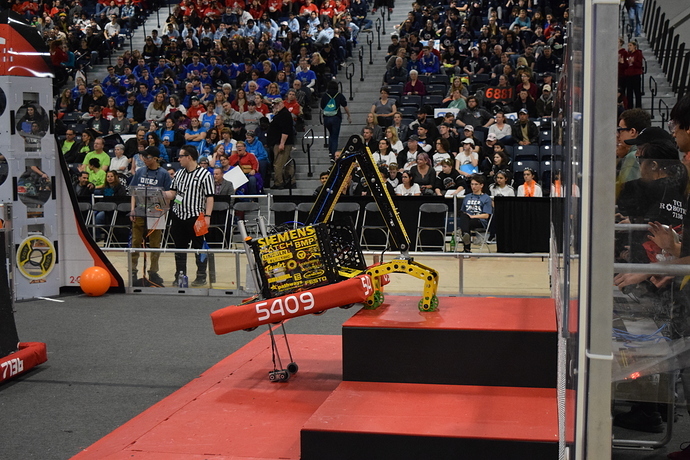 Overall I think the 5409 bot was really well done this year and looking forward to seeing next years! I really liked your robot. It was pretty darn slick. I’m not a huge fan of the use of bevel gears in the arm joints. I’d maybe try and stiffen up your climber if you have the room and weight. Yes, the powder coating on the 5409 bot is fantastic for sure. At Windsor we had issues with our bevel gears and motors, making us look really shaky. It was fixed by Quarters though, thanks to 4992. As for the cargo intake, we had another design that got scrapped a week before bag, so our design team came up with the current intake in 2 days so that we could manufacture it. 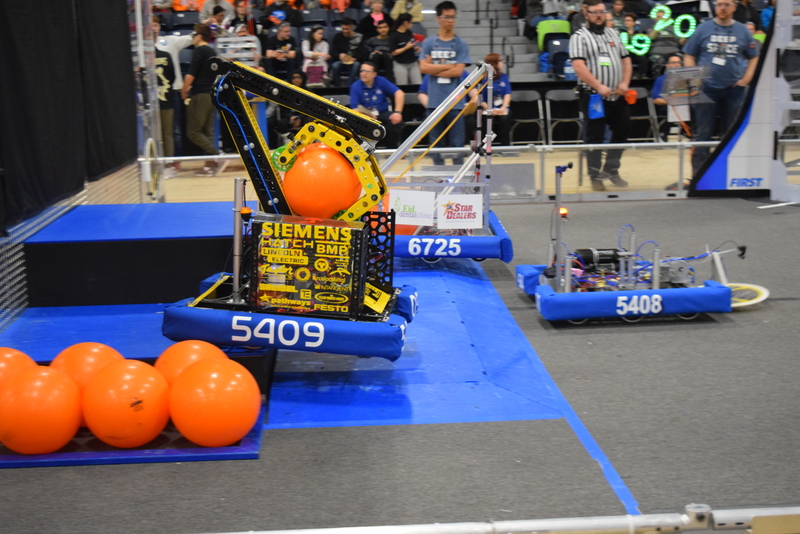 Our hatch mechanism was never used during our season, due to the fact that it was never fully complete until after we got eliminated at DCMP. I’m glad you enjoyed our robot though!